Our understanding of the Universe has come under increased scrutiny over the last 25 years. New instruments have opened new fascinating perspectives for testing General Relativity and alternative theories of gravitation, for studying quantum mechanics and exploring the boundaries of quantum gravity. Violations of the principle laws of the current theories underpinning these areas can give clues to the unification of the four forces, or lead the way for the discovery of new interactions and particles. The aim of the Fundamental Physics Explorer (FPE) is to provide the means to test the assumptions that form the foundations of modern physics in a cost effective and efficient manner. The FPE programme could consist of three spacecraft each re-using a small platform, accessing the space environment to take advantage of zero-gravity thus improving the precision of current measurements. The FPE Technology Reference Study (TRS) aims to identify the key enabling technologies and the challenges that must be overcome, to measure small violations in these fundamental principles. It is assumed that a small VEGA/Rockot launcher will place each spacecraft into orbit. A Sun-Synchronous orbit is suggested for FPE-B and C. The use of this orbit enables a high level of thermal stability due to a minimal number of eclipses. FPE-A requires an elliptical orbit which, if properly designed, may result in lengthy eclipse-free periods. As a target, these spacecraft are baselined to have a mass of not more than 1000 kg to make them compatible with the use of a smaller, cheaper launch vehicle. Each mission would have a nominal duration of 4-12 months. The short timescales reduce mission costs by decreasing operational requirements and demands. Each mission will test a specific area of fundamental physics conducting experiments with a single payload. One of the foundations of Special Relativity (SR) is the Local Lorentz Invariance (LLI). According to this principle, the outcome of any local test experiment is independent of the velocity of the freely falling apparatus. One test of this postulate to an unprecedented accuracy level would be the utilization of different frequency standards. These include clocks based on ultra-stable high-finesse resonators, atomic clocks in the optical domain and performing both on-board and space-to-ground comparisons as a function of the orbital motion of the spacecraft. Depending on the particular scheme, the set-up will be sensitive to violations of Einstein's theory of Special Relativity induced by variations of the speed of light with the orientation or the velocity of the local reference frame (tests of the isotropy and constancy of the speed of light). Measurements would allow the estimation of key parameters in alternative theories. As a direct consequence of Einstein's Equivalence Principle, identical clocks placed at different positions in stationary gravitational fields will experience a frequency shift that, in the frame of the post-Newtonian approximation (PPN), is proportional to the difference of the Newtonian potential at the positions of the clocks. Space-to-ground and on-board comparisons of atomic clocks in the optical domain can be used to accurately test Einstein's prediction, to verify the universality of the gravitational redshift and, at the same time, to detect possible time variations of fundamental constants. Such experiments would provide a comprehensive test of the Local Position Invariance (LPI) principle, which together with the Weak Equivalence Principle and Local Lorentz Invariance, constitutes the base of Einstein's theory of General Relativity. Such tests would significantly improve presently available experimental results. *It should be noted that the aim is to design a mission concept that would be simple and low cost. Achievement of all the scientific objectives may not be possible. The Weak Equivalence Principle (WEP) postulates the independence of the world line of a freely falling test body on its structure and composition. This axiom represents one of the cornerstones not only for Einstein's theory of General Relativity, but also for almost all modern theories of gravitation. Inspired by previous concepts (e.g. STEP, GG, MICROSCOPE, HYPER), FPE-B will look for violations of the universality of free fall (testing the WEP) and looking for experimental indication of alternative theories of gravitation. The parameter historically used to quantify a deviation from the WEP of two test bodies with different composition, inertial mass, and gravitational mass is the Eötvös parameter ( ). It is a ratio of the differential acceleration between two objects and the average combined acceleration. If the WEP is true, this parameter will be zero. The best drop tower experiment confirmed the validity of the WEP to 3 × 10-10 accuracy . An Earth-Moon experiment based on laser ranging provided to an uncertainty of 10-13. Tests with an accuracy at the 5 × 10-13 level can be performed on ground using torsion balances . Compare at least two free-falling test bodies of different structure and composition (macroscopic test masses or atomic samples) to an accuracy of = 10-17. More test masses are desirable to augment the baseline test, but options may be limited. A gas cloud of identical particles cooled down to very low temperatures and constrained in trapping potentials undergoes a phase transition from a classical to a macroscopic quantum system known as a Bose Einstein Condensate (BEC). All particles of a BEC are occupying the lowest energetic states of the confining potential behaving as a single quantum many-body system with well defined properties. The preliminary work conducted on the payload has highlighted the following possibilities for each mission to achieve the science goals. An ensemble of atomic clocks based on optical transition and ultra stable cavity resonators could provide the frequency reference with which to perform the measurements. Frequencies between clocks will be compared to a high degree of accuracy. Optical clocks with fractional frequency instability and inaccuracy at the 10-18 level are required. This should be achievable in a quiet (drag-free) space environment. An atomic clock consists of an oscillator locked to an ultra-stable atomic transition. Optical clocks are based on transitions in the visible domain of the electromagnetic spectrum, which serves as a reference for stabilizing the frequency of the reference oscillator. The number of clocks and the specific atomic transitions has to be properly selected to optimize the outcome of the proposed tests. There are several options for the attempt to measure violations in the WEP. The validity of the WEP can be tested using a differential accelerometer (DA). Attention has been given to STEP-like cryogenically cooled super-conducting DAs , the Galileo Galilei mechanical scheme , and atom interferometry . The principle is to sense the differential displacement of two co-axial co-incident test masses using SQUIDs. The movement of each test mass generates a current in a common circuit to both test masses, which provides the acceleration signal. Because the circuits flow in the opposite sense, any difference in motion will force a current through the circuit common to both test masses. The SQUID senses the tiny magnetic field resulting from this flow of current. To operate a Superconducting Interference Device (SQUID), extremely low temperatures are required resulting in the need for a cryostat. Shown in the diagram below is an example of the 'differential mode' circuit. The instrument itself could consist of two DAs contained within a quartz block. The assembly could be placed within a cryostat to achieve operating temperatures of 1.8K, necessary for the superconducting elements. This baseline design follows very closely the configuration proposed for the Mini-STEP mission . Consideration has been given to the use of an atom interferometry based DA. This removes the need for cryogenics. An assessment of the feasibility of such an instrument is on going. This would involve the probing of a mixture of two gases using three pulsed Raman/Bragg lasers to split and recombine the matter waves. In GG, the test masses are concentric, hollow, coaxial cylinders coupled in a beam balance system with the beam directed along the symmetry axis. The instrument is composed of two concentric differential accelerometers, the inner one based on two test masses with different structure and composition for detecting violations of the Universality of Free Fall and the outer one with cylinders of the same material, for zero check (calibration purposes). Both differential accelerometers are sensitive in the plane orthogonal to the symmetry axis. Test cylinders, suspended mechanically, spin at a frequency ωs higher than the natural frequency ωn. In this case, the non-zero displacement vector from the spin axis due to construction and mounting errors is reduced by a factor -(ωn/ωs)². The phenomenon, known as auto-centring in super critical rotation, requires two degrees of freedom. This payload will accommodate an experimental apparatus for producing Bose-Einstein condensates. Atomic samples will be trapped, cooled to the BEC phase transition and then used for the experiments mentioned above. Depending on the kind of experiment, different experimental techniques will be implemented. The evolution of the atomic sample will be monitored by using imaging techniques based on resonant absorption. Assembly of the extremely stable structure of the LISA Pathfinder Science Module, March 2007. The spacecraft could consist of a payload module (PLM) and a service module (SVM). The SVM is to be re-used for each mission and capable of supporting each PLM with small adjustments in interface and resource requirements. The aim is to have a SVM which provides a generic internal bay for the PLM and can be changed depending on the mission. Precision measurements performed with clocks, matter wave interferometers, and differential accelerometers require a high level of control of non-gravitational forces acting on the spacecraft. To achieve this objective, a Drag Free Control System (DFACS) needs to be implemented. The motion of a freely falling test mass can be used to provide acceleration information to the DFACS system, to apply minute trusts to compensate. 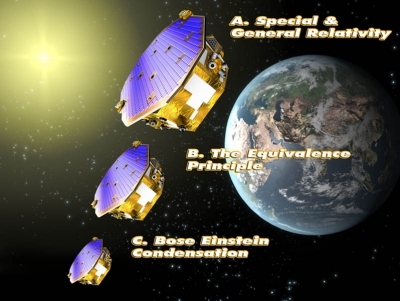 Such systems are presently under study in the LISA Pathfinder mission. 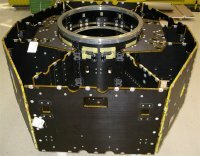 A constraint applied to the payload is that it must fit within the payload envelope on board the LISA Pathfinder platform and be compatible with available spacecraft resources. The development of optical clocks capable of fractional frequency instabilities of 10-15 at 1s down to 10-18 at 10 days of integration time. This will include a device to down convert the THz clock frequencies to be compatible with standard electronics (a frequency comb). The development of high performance time and frequency transfer systems is key for comparing the stable and accurate frequency standard generated by the on-board optical clocks to ground based clocks without deteriorating the signal stability. Development work is required to build and space qualify a differential accelerometer capable of measuring a tiny difference in acceleration to the 10-17 level. This could be using a SQUID or atomic interferometry type device. The manipulation and cooling of cold quantum gases is a technology that has to be qualified for space applications. These activities will however take advantage of the work performed in the frame of the ACES ("Atomic Clock Ensemble in Space") mission. The successful implementation of drag-free control inertial sensors. Experiments of an FPE nature have been performed on ground while technology developments are ongoing. The case for space is to take advantage of micro-gravity to improve measurements yet further. The overall challenge is to develop space qualified instruments capable of achieving the science goals. This study was performed by SRE-PAM and completed in 2007. The final report, Binns (2007) is available to download (see Related Publications on the right-hand menu). Nobili, A.M. et al. "Galileo Galilei (GG). Proposed Space Experiment to Test the Equivalence Principle and Preliminary Results from Prototype on the Ground," NASA D-18925, Proceedings of the NASA/JPL International Conference on 'Fundamental Physics in Space', 30 April - 1 May, Washington DC.